Yes, LED Poi for all. We are very proud of the large range of available LED Poi Balls sets we stock. And are always looking out for new designs that we can test and if suitable add to the Home of Poi collection. 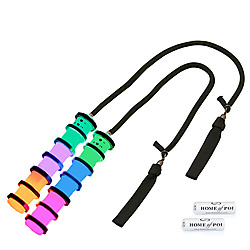 Our selection of LED Poi are guaranteed to satisfy or you can get your money back. We also offer the 'Home of Poi 12 month warranty' on all our LED Poi ensuring a hassle free process should something go wrong. We do not cover abuse or accidents however we stock a huge range of parts to repair if run over, chewed by dog, broken or if missing/lost. Look out for the [purchase parts] button on the product pages. Have fun, turn them on and light up the night! The 6 inch length glowsticks were a great introduction to glow stick Poi. They were dependable and you could extend their life by putting in the fridge/freezer. Or make them extra bright by heating the glowstick up by dipping in hot water. Light Poi was advanced with better LED's and Full Color LED's. You could then buy LED Poi that changed color and could be switched on and off with ease. Glow in the dark Poi rose to a new level with added control chips providing functions of strobe, fade, and patterns. We no longer have Pod Poi for sale or the Pod Poi v2 but have several other new light up highly visual Poi for sale. The output power of LEDs has increased incredibly over the past 10 years. We love bright LED Poi, however you should not remove the LED unit and stare at the raw LED source as with all powerful lights this can hurt and in some cases damage your eyes. It is the same as holding a light torch close to and pointing into your eye.